The phrase- ‘Give a man a fish, and you feed him for a day. Teach a man to fish, and you feed him for a lifetime’ perfectly fits in the situation which is fabricated by Congress President Rahul Gandhi on Monday. Gandhi announced what he called a “historic” minimum income guarantee assuring Rs. 72,000 a year for India’s poorest families if the Congress came to power. Rahul also recalled the “Garibi Hatao” slogan which was given by his grandmother and then prime minister Indira Gandhi in 1971. 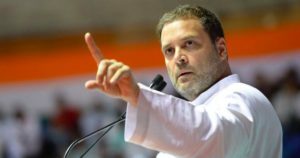 Rahul Gandhi’s election promise to give each of India’s poorest 20% families Rs 6,000 per month — that is, 12 times what prime minister Narendra Modi has promised to give poor farmers. Gandhi’s modified Universal Basic Income (UBI) appears to be promising an end to the corruption-ridden subsidy regime India has run for the last 70 years, and, more important, India will have zero poverty once the scheme is implemented. Here where the devil lies, Congress president is the promising moon to the poor, which they won’t be able to handle. To cover a fifth of India’s 25 crore households would be Rs 360,000 crore, about 13% of India’s total budget! An obvious question, that arose even when Modi was promising the farmers Rs 6,000 per year, is how much this is going to cost and how this is to be funded. Simple arithmetic tells you the scheme will cost Rs 360,000 crore, an amount that is far greater than what the central government spends on all manner of subsidies, from food to electricity, fertilizers, water, scholarships, rations, etc. 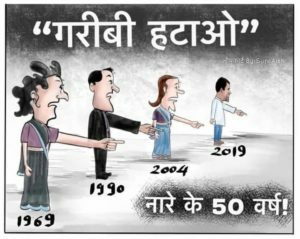 Now lets come to the point, this “Garibi hatao” slogan is not new from INC. India’s first female prime minister Indira Gandhi and the grandmother of Rahul Gandhi introduced this chant in 70s. Why poor remained poor, even after 70 years of democratic rule in India and more than 50 years of Congress rule? Who will think about educating them and teach them to fish on their own?